Before we get started on this subject you need to be aware of a couple of things. First, we at Haus Rheinwood tend to follow the recommendations found within the book called “Germanic Heathenry; A Practical Guide” By James Hjuka Coulter http://www.authorhouse.com/BookStore/ItemDetail.aspx?bookid=17274. Second, in this piece, in accordance with the contents of Hjuka’s book, the word Samal is synonymous (or means the same as) Sumbel. Blot (rhymes with “boat”) is in reference to "blood" and often times an animal sacrifice, in which Haus Rheinwood does not participate; even though we know that there is a resurgence of the practice. The word "Fagende" (pronounced "fah-yend-e") then, refers to a formal celebration; minus any animal/blood sacrifice and substituted with offerings of mead. We highly recommend this book to formulate your observances. 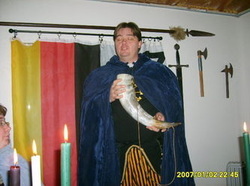 Several of us within Haus Rheinwood have come to Heathenry through Wicca. Wicca is LOADED with ritual and ceremony; speaking for myself, I found that part of it to be problematic coming into Heathenry via Wicca. While Wicca tells a very good story in its Eight-Spoked Wheel of the Year and is quite fanciful, Heathenry's rituals are more down to earth. Heathenry’s most practiced and repeated high ritual is that of Samal. Samal can be practiced any time a group of Heathens get together for any reason. Third round is open and can consist of gifting, poetry, song, etc. 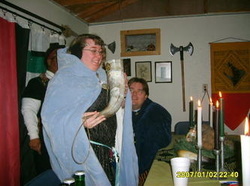 A horn of mead (the preferred drink of Heathenry) is filled and is passed around to the participants. Be prepared for a highly charged time of standing before those in your company as well as the Spirits present as you speak from your heart and often times expose the innermost part of your being. 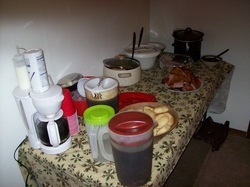 A Fagende is a formal, ritualized feast connected to a Samal. It’s a time to don garb as we hold a celebration of our Faith, our Heathen community and make personal connections. Most people are familiar with the word “blot”. Blot is a term used in connection with a blood/animal sacrifice. I’m sure that many find this practice fulfilling as it connects them with ancient practices. As being a part of modern Heathenry I personally find this practice totally unnecessary and in certain ways abhorrent I must say, however, there are those within the word of Heathenry who still practice animal sacrifice today. That may be all fine-well-and-good for them: I just don’t feel comfortable doing it nor do I encourage anyone within Rheinwood Hearth Kindred to participate in it. So a Faining (minus the blot) is a favorable way for me/us to still celebrate our Faith in a meaningful and dramatic way. We at Haus Rheinwood generally reserve Fagende for Iul and Midsummer. However there is nothing wrong with having a Fagende for the other seasonal celebrations throughout the year.